So far this winter the UK has been rather “void” of any significant snowfall. Most places haven’t seen a flake at all. And although it will be turning a lot colder late next week – and with it the risk of snow in places, it’s too far out to be forecasting where, and exactly how much snow will fall. Those kind of accuracies in weather forecasting can only be expected a little nearer the time. For now though temperatures are quite cold, and this will continue up until say Sunday. A few milder days can be expected on Sunday, Monday and Tuesday in the south, and by en large dry however northern areas will turn increasingly unsettled later on Tuesday with in places gale force northerly winds. Tuesday night marks a transition into much colder conditions for the remainder of next week – cold easterly winds with temperatures below average for many, especially in land. On the east coast there will be showers, however because the air isn’t especially cold, on coastal strips the showers will fall mostly as rain or sleet. 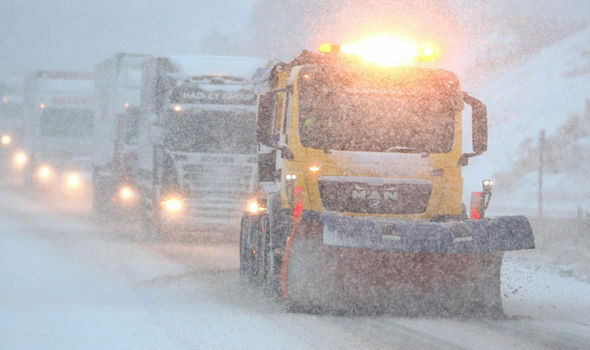 In land though, especially for parts of the Midlands, places with elevation such as the Pennines and North York Moors, some accumulating snowfall is likely by say Wednesday and Thursday, a few centimeters in places. To lower levels there will more of a slushy mix, perhaps some snow but probably more rainy in nature. The showers will mostly be for central and eastern areas of England, further north and west into Wales, Ireland and south west England, there will be a lot more dry weather. Cold though during the overnight period later next week for all – with a frost away from those showers. Let’s get one thing straight – this is no beast from the east, to get a “BFTE” you need very cold air originated straight from Siberia, and strong winds to boot to help generate snow showers off the north sea. Although this will be a cold spell, and there will be some snow around, it is no where near the severity needed to be named a beast from the east. More updated will be issued in the next few days. This entry was posted in Long Range Weather, Uncategorized, Winter 2018 Weather Forecasts Long Range on January 3, 2019 by admin8. So far this Autumn temperatures have been milder than average. Temperatures are up to 2 to 6 ‘F higher than you would usually expect right now for much of the states, especially around the lakes and the north east, and the west. However there are some signs that temperatures will take a significant, sharp plunge next week, especially around the lakes, Minnesota, the Dakotas and into Ontario, with many computer models predicting a wave of intense cold to flood the north and east of the states, especially around the great lakes, from around the 6th of November. There is some uncertainty, and it looks like the cold wont make it that far south and east, potentially stopping and lake Erie, keeping the east coast relatively mild. It’s too early to start forecasting snow events and the like, however there are solid signs of the potential for prolonged heavy snow for the northern lakes, Ontario next week Nov. 7th and Nov 8th. 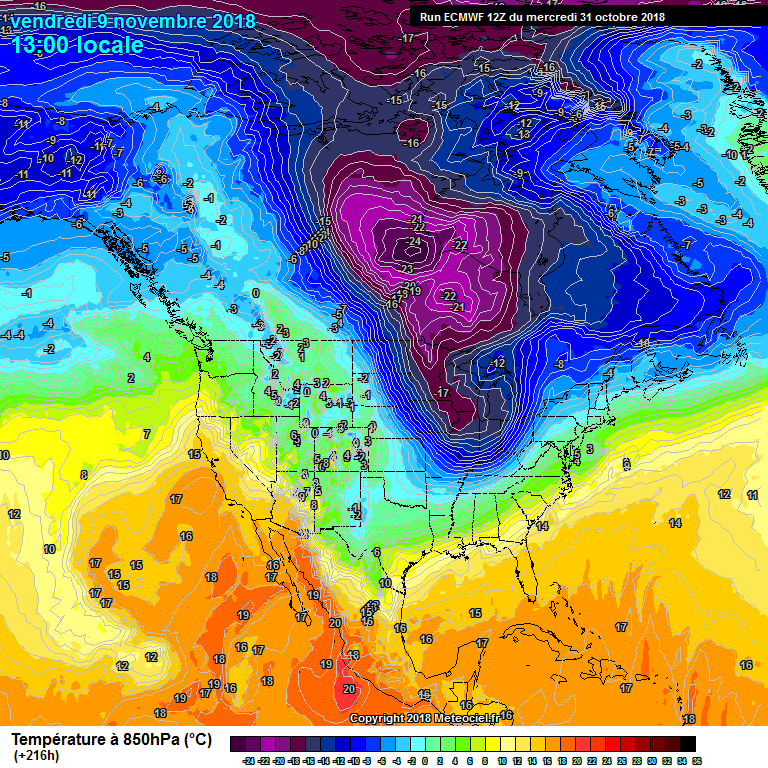 The ECMWF weather model (European model) is also predicting a big dive in temperature. Take a look at the current temperatures for the 31st of October 2018, today, and compare them to on the 9th of November. As you can see, a significant dive in temperature. There would be a high risk of snow to, some significant lake effect snow would be possible as well as winter storms and snow storms / systems. The data you should be aware of or “pencil into your diary” is from around the 6th of November, for a rapid cool down across many north eastern areas. The North West would be a little less cold and drier under the influence of high pressure. 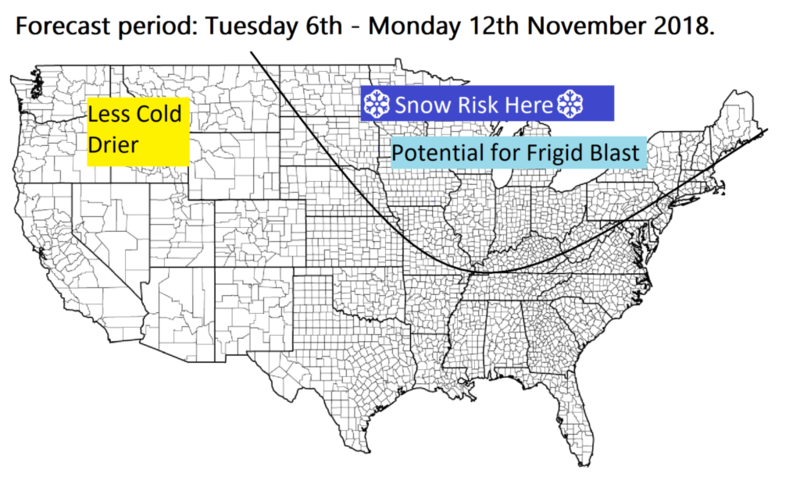 However I think we should keep a close eye on the snow forecast for later next week for northern states of the U.S. This entry was posted in Long Range, Long Range Weather, Winter 2018 Weather Forecasts Long Range, Winter snow warnings on October 31, 2018 by admin8. Following winter storm Gia which blanketed large parts of the central US and up to the mid Atlantic coast in North Carolina with up to 12 inches of snow in places, the pattern remains favorable for more cold outbreaks and winter snow storms for the remainder of January. There’s also growing confidence of the next Winter Storm, which could affect the north east this Friday. Many north east states could see 4-6 inches of snowfall through Friday giving way to slick travelling conditions. The GFS weather model is forecasting settling snow for inland areas of Pennsylvania, New York state, Massechuesets, New Hampshire, Vermont and Maine. There’s definite signs of a possibility of a true mid winter blizzard late this weekend (Sunday into Monday). However – there is also some uncertainty. Some weather models paint a very dangerous scenario for this weekend with a tight boundary between milder air to the south and cold air to the north producing a very potent winter storm system / blizzard for much of the central and north eastern / eastern portions of the US. 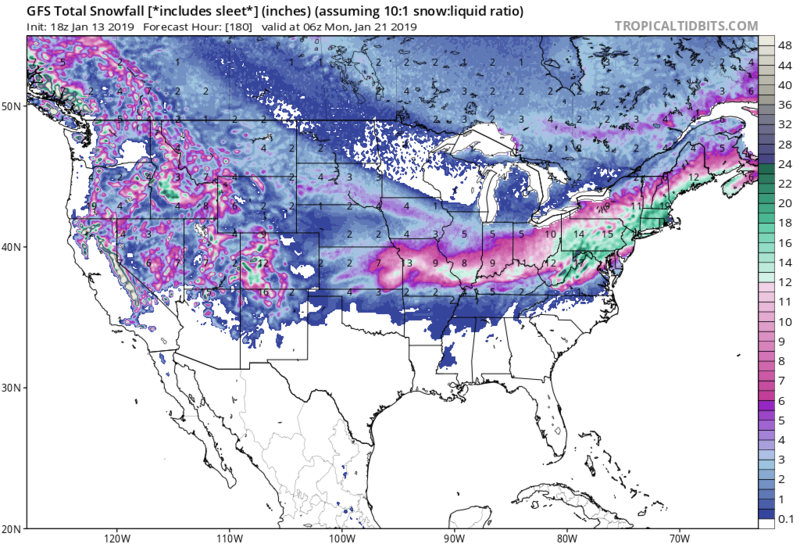 In fact some computer models are forecasting multi states to recieve widespread 1ft + of snowfall. Usually when these things pop up in the “Long range” output we tend to disregard them, however since the majority of computer models are forecasting this event now, the potential is growing and SHOULD NOT be ignored. Please make sure you keep a close eye on forecasts over the next few days. 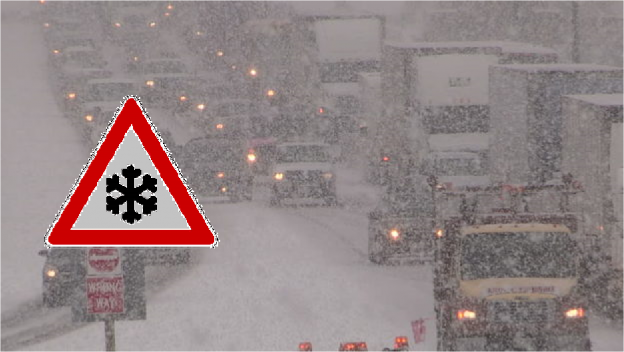 This is not a system to mess around with and could bring significant disruption Sunday 20th – Monday 21st. This entry was posted in Long Range, Long Range Weather, Winter 2018 Weather Forecasts Long Range on October 24, 2018 by admin8. An El Nino, a spell of warmer than average sea surface temperatures in the Pacific, is significant for the Winter 2018-2019 weather forecast. The opposite of “La Nina”, an El Nino event is typically associated with a strong polar jet affecting the north eastern states of the United States from Quebec, Nova Scotia and into Maine to the Great Lakes, bringing colder than average weather and more persistent snowfalls, whilst the Pacific North West favors dry and temperatures slightly milder than average. After a UK Winter Forecast instead? Click here to get more information. Explanation of the Winter Forecast: 1. United States. As you can see a significant three way split is evident for the winter period. The southern states, from Tx to Fl experience a rather wet and cool winter with temperatures slightly colder than average and “high” precipitation. Temperature wise the north west is warmer thanks to a strong ridge or area of high pressure producing a fair deal of settled weather, and temperatures will be higher than average, but of course this is the upper North West and North West Canada we are talking about so it will still be freezing, but perhaps not as snowy here in November to December as it was during last winter. And the upper north west: an active polar jet increasing the snow totals prediction for winter 2018-2019 to higher than average, slightly. 1. 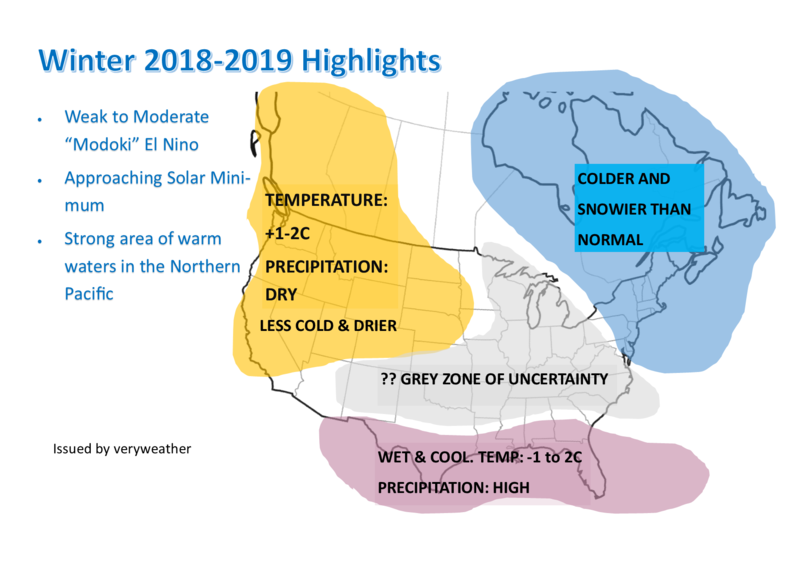 El Nino outlook for Winter 2018-2019 We are speaking relative, so when the map suggests “less cold” over the Pacific Northwest for states like Oregon, Montana etc, it will still be cold there of course, however forecast “less cold” compared to the average. We are also suggesting slightly drier than average conditions for the north west of the U.S, mostly due to El Nino. This would result in slightly less snow than average. You can see more on how El Nino impacts the pattern here. There is a difference with El Nino this year, however. We are expecting a more “Central” based El Nino with the bulk of the warm Pacific sea surface temperatures centered over the central Pacific region as opposed to spread out equally thought the Pacific region. This could have the impact of weakening the El Nino signal slightly and “relax” the pattern we would see during a “uniform” El Nino event. 2. Low Solar Activity (Solar Minimum) forecast. In the recent long range weather information posted by us, we have mentioned this idea of solar minimum often. The current phase of solar cycle means there are barely any sunspots and, this has impacts on the outer magnetosphere, the layer that is between the atmosphere and space, as the sun is a significant driver of our climate. For Winter 2018-2019, a reduced or “minimal” level of solar activity could introduce more in the way of Northern Blocking, which strengthens the polar jet stream and amount of cold air that “falls” or empties out of the polar regions. This increases the cold signal for the United States. However El Nino usually restricts the cold to the North East of the country, so we can be fairly confident that the North East will see it’s fair share of cold plunges, noreasters and snow for winter forecast 2018-2019. An EL NINO is a natural occurrence in the Pacific ocean – and is forecast for winter 2018-2019. El Nino is basically warmer than average sea surface temperatures in the central Pacific. Currently forecast to be between +0.5C and +1.5C above average by December, this is a weak to moderate El Nino. However, combined with very low solar activity, some parts of the U.S or U.K will most likely experience a very cold winter. El Nino’s affect on the polar jet stream producing a cold north east is well known in winter..
Current thinking suggests for winter 2018-2019 the coldest weather compared to average will be in the north east and mildest driest weather in the north west due to a weak El Nino. However very low solar activity means that much of the U.S could experience intense winter weather and colder than average conditions although this at the moment is uncertain. 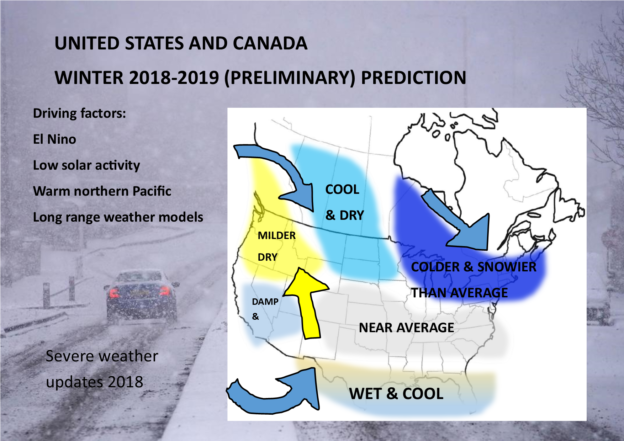 The great lakes and north east has a higher chance this winter of seeing a Long term weather forecasting is not an exact science and this preliminary forecast by no means guarantees accuracy. The UK and Ireland have a very variable climate. It is impossible to predict more than 5-7 days out with much reasonable accuracy. However the current thinking suggests that this winter may be colder than average, like the previous one. Very low sunspot numbers suggests a cold long range forecast for the UK into the winter months as we are at the part of the solar cycle that supports cold winter weather. Come back on the 10th of October for another issue of veryweather’s WINTER 2018-2019 preliminary forecast for further information. This entry was posted in Long Range, Long Range Weather, Winter 2018 Weather Forecasts Long Range, Winter snow warnings on October 7, 2018 by admin8. After an early cold shot affected Canada and a record 12.9″ of snowfall was recorded in Calgary, it’s now the turn of the US to (in places in the north) see it’s first significant notable snow event of the season. A rather small area is forecast to experience snow flurries on Sunday afternoon and into Monday in the northern Rocky mountains, in an area from eastern Wyoming (Gilette) and into western South Dakota (Cluster/ Rapid city) and into western North Dakota. 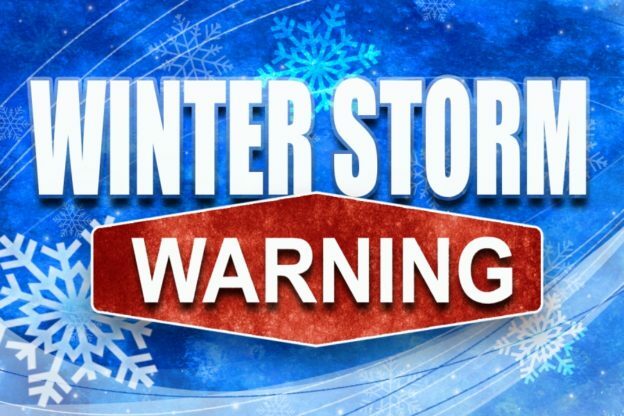 Up to 10 inches of snow may fall locally however largely 2-8 inches will fall. Snow may fall to elevations as low as 2,600ft. However it’s next week when significant snow could impact a larger area of the U.S. This snow will be fairly localized and, shouldn’t cause too many problems. However there are some signs that we could see a next more significant band of snow work across parts of the U.S. during the middle of next week especially Wednesday through Friday. Some computer simulations are expecting heavy snow through Eastern Wyoming into North Dakota and Montana through Tuesday and Wednesday, and perhaps even affecting northern Minnesota Wednesday through Friday, before moving through Manitoba and much of Ontario. This winter storm could potentially dump snow to elevations as low as 1,000ft, with 2 to 8 inches also possible. 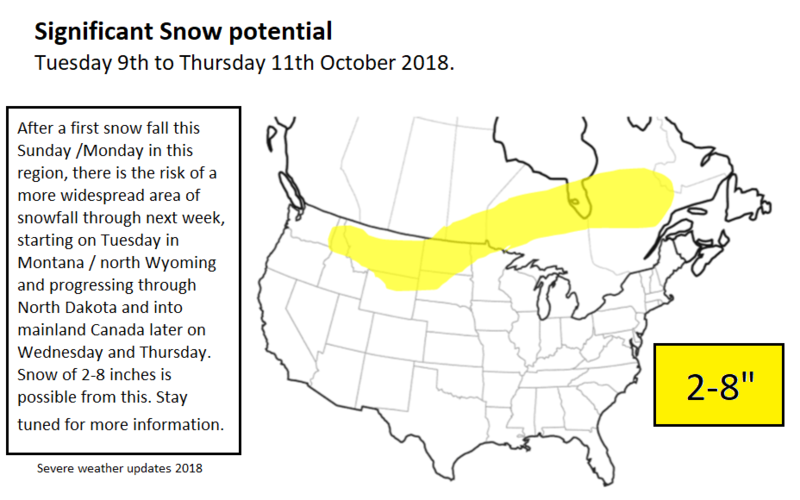 1) This early snow storm could have significant impacts through mid next week in the Northern Rockies & MO/ Manitoba / Ontario regions and regions stated. Mostly because it is earlier than you would usually expected. 2) The forecast can and will change slightly between now and then, this is not an exact forecast and is just an indication as to what may be ahead. This entry was posted in Long Range, Long Range Weather, Winter 2018 Weather Forecasts Long Range, Winter snow warnings on October 5, 2018 by admin8.